" " wisno wood furniture finishing: Antique texture aluminum finish. Aluminum is important metal in our life. The metal offers many advantages that make it widely used for various purposes. It is durable, relatively inexpensive, soft and easy to be handled. The aluminum is also widely used in the furniture industry. Aluminum is relatively easy to be cut, bended, forged, and formed to make furniture with an attractive appearance. Aluminum is also relatively easy to be finished compared with the other metal. It is less dense compare with copper or brass; it can receive and absorb the material finishing better then the steel, brass or copper. Compare with the iron aluminum has better properties since it wont get corrosion. We don,t need the primer coat as the corrosion protection as finish for the iron surface. We can use the finishing materials that we normally used for the wood finishing. The stain and glaze for wood finishing can be applied on the alumiunum together with nc or PU coating. But to give better performance the special coatings for metals is recomended as the coating layer. Now in this post, i want to share about the finishing process to make the antique teksture for aluminum. The aluminum is textured to make the impression of antique ans special looked; the application of glaze and pad stain are used to build the color and antique effect. To build the better film layer we use the brass lacquer for the clear coat, a special clear coating for brass and copper. Here is the finishing process step by step. The preparation of aluminum panel. 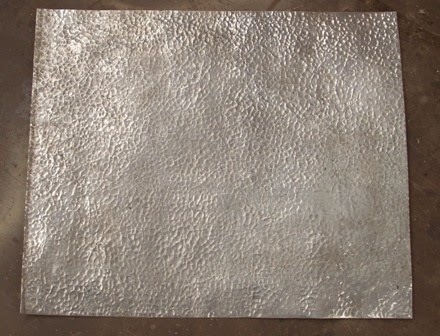 The aluminum is textured with special form The special skilled people is needed to make the texture. The process is done by the skilled artisan from Cepogo, Boyolali. 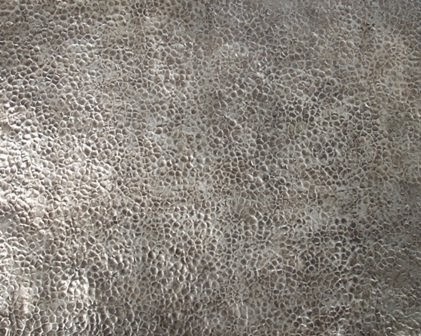 The texture aluminum panel then need to be washed and cleaned before layered with the finishing material. Wet a rag with acetone or paint thinner and wipe it to the aluminum surface to clean any grease, oil or other dirt. Repeat the process several times to make sure the aluminum surface has clean from any dirt or grease. The clear coating application is needed as the first step any before any stain and glaze application on the metal surface. The coating layer is function as the base and binder for the stain and glaze that will be applied on. Appy 1 layer coat of brass laquer by medium wet spray to the overal surface. Let it dry for about 15 minutes. This glaze is applied to form the color and to make the antique effect at the finish. The glaze will fill the texture to make the “ life looked" at the finishing. Cut the glaze with thinner about 1 : 4 then spray it with medium wet or dry spray to overall surface. Make sure we got a uniform coating. Let it dry for few minutes and highlight the glaze layer with steelwool. If necessary we can brush the glaze lightly to smooth the surface and make more antique looked. Avoid too thick layer of the glaze since it could lead to the crack and adhesion problem. Make sure the glaze layer is dry and go to the next coating application. Brass lacquer is applied to is provide the protection to the color and effects resulted by the glaze application. Spray brass 1 coat of brass lacquer with medium wet spray to overall surface evenly. Wait for about 15 minutes to make sure the coating layer is dry. Pad stain is used to make additional colors and make more impression looked for the finish. Apply the pad stain by padding on the finish surface. Dampen a cloth and that pad it to the finish surface as needed. Highlight the stain with steel wool if necessary. Brass lacquer is applied as the final coat. We also apply the brass laquer for the previuos step as the” sealer”, but in this step the brass lacquer is function as the top coat. We use the same material for the sealer and top coat. But as the final coat we need to make sure we use the brass lacquer with the right sheen. A prefect application is also needed to make the smooth and even coating surface. Use the low or medium sheen bras lacquer and spray it to the overall surface evenly. Let it dry and check the result to make sure we get the smooth and even surface. If necessary we can repeat the top coat application to make the good film finish.